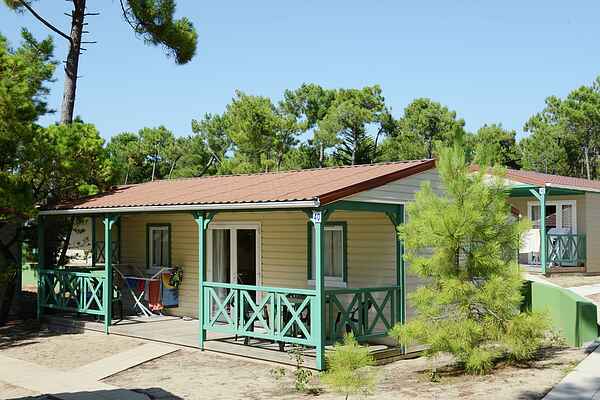 Atlantic Vacances family park has 63 simple, impeccably tidy wooden chalets. There is a living room with sleeping accommodation and a dining area and there's a kitchenette with a fridge and microwave. All accommodations have a covered patio with garden furniture. Wooden chalet (FR-85270-19) for 4 people. There are 2 bedrooms. Bedroom 1 has a double bed. Bedroom 2 has a bunk bed or 2 single beds. There is a bathroom with a shower and toilet. Wooden chalet (FR-85270-20) for 6 people. There are 3 bedrooms. Bedroom 1 has a double bed. Bedroom 2 has a bunk bed. Bedroom 3 has a double bed or 2 single beds. There is a bathroom with a shower. There's a separate toilet.